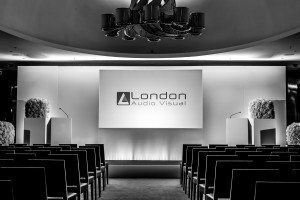 The height of the room: We often choose a screen size according to how many people will be in the audience, sometimes this means the screen may be too large for the room and it would be better to make an alternative suggestion. Throw distance: This refers to the distance between the screen and the projector. 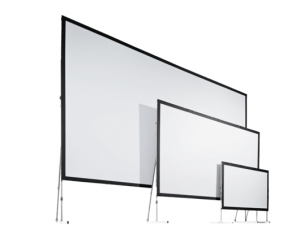 If you have a medium throw distance, or you need for people to be able to walk in front of the screen without interrupting the image, we would advise a rear projection screen where the projector is placed behind the screen. 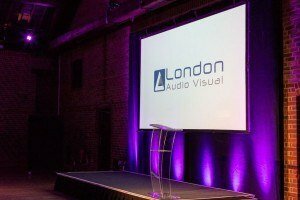 This creates a smart, clutter free area in front of your screen helping your event to run smoothly. When using rear projection a Drape Kit is included, this hides the projector beam from the audience. Screen Ratio: It is good to keep this in mind if you would like to make full use of the screen. Most Power Point presentations default to a 4:3 which is the same dimension as the typical projection screen. However, if you’re planning on showing a movie or giving a presentation which has been set to a 16:9 ratio (widescreen) is better to request a Fast-fold screen with this feature as you can then avoid the ‘letterbox’ effect. Sizes: The easiest guidelines we use in order to determine the correct size to choose is; how many people viewing the screen and what is the purpose of the screen? Once you have your measurement of the screen we will make allowance for the legs and you have an idea of how large the screen will be. Types of screens: Some of the most common screens used are Tripod screen, which offers front projection. The general size comes in 6’ x 6’. We would recommended this screen for an audience size of 1-20 people. Fast-Fold Screen, which allows for front and rear projection. This screen comes in a range of sizes. We would recommended this for an audience size of 15-300 people.